Learn to build an Android app, meet Twitter engineers, and tour San Francisco in our weeklong Early Bird Camp. Twitter will offer sixteen current sophomores the chance to participate in a week-long educational summer program at Twitter's headquarters in San Francisco, California from June 12th to June 18th, 2016. We are looking for students with strong academic records, at least one year of experience in Java, limited to no experience programming in Android, and a demonstrated passion for computer science development. Throughout the week, you'll attend hands-on coding workshops and leadership sessions, build an Android app, and tour San Francisco—all while being mentored by incredible Twitter engineers from across the U.S.
We are committed to addressing and promoting diversity in the technology industry. We specifically encourage students who are members of groups historically underrepresented in technology to apply. Aplications are open now and the deadline to apply is Thursday, March 31st, 2016 at 11:59pm. Learn to build an Android app, meet Twitter engineers, and tour San Francisco in our weeklong Early Bird Camp. Twitter will offer sixteen current college sophomores the chance to participate in a weeklong educational summer program at Twitter's headquarters in San Francisco, California from June 12-June 18, 2016. Throughout the week, you'll attend hands-on coding workshops and leadership sessions, build an Android app, and tour San Francisco—all while being mentored by incredible Twitter engineers from across the US. 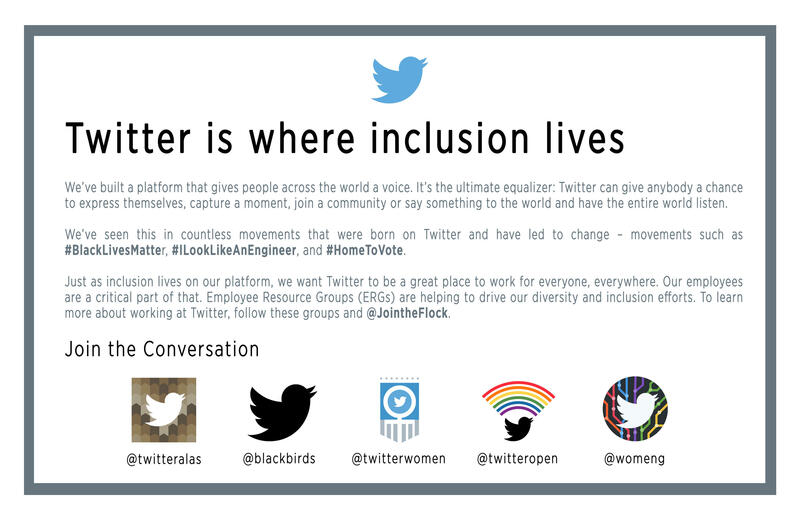 Twitter is committed to advancing inclusion and promoting diversity in the technology industry. We specifically encourage students who are members of groups historically underrepresented in technology to apply. Aplications are open now and the deadline to apply is Thursday, March 31st, 2016 at 11:59pm. Finalists will be notified at the end of April. You'll learn how to build an Android app and work closely with Twitter engineers while building code, gaining career insight, and developing leadership and collaboration skills. Collaborate with fellow campers to build an awesome app, that you'll be proud of, and walk away with strong, lifelong connections. Not in the Bay Area? No worries, we've got you covered. We'll pay for your roundtrip travel to San Francisco, cover your meals with the group, and provide you with a hotel room to share with a fellow camper. Current sophomore/second-year student enrolled full-time in an AA/AS or BA/BS program at a US College or University. Pursuing a degree in computer science, computer engineering, or a related technical major. One year of experience with Java programming language. Available to attend camp from June 12-18, 2016.